Many LGBTQ2S+ people choose to parent. However, many LGBTQ2S+ people must rely on outside assistance to create their families, including use of assisted human reproduction (AHR) services (see Note 1, Note 2). As a result, LGBTQ2S+ people make up a significant proportion of AHR service users in some parts of Canada (i.e., up to 30%, as reported by one Toronto clinic). Despite this high rate of service utilization, much of the academic literature about LGBTQ2S+ people and AHR services has been comprised of papers debating whether LGBTQ2S+ people should have access to AHR services. These debates stem from widespread societal misconceptions about the presumed inadequacy of LGBTQ2S+ people as parents. In contrast, the impact of these societal misconceptions on provision of AHR services to LGBT people has not been well studied. This is an important gap: in 2008 an expert panel convened by the Ontario Ministry of Children and Youth Services examined the barriers to accessing fertility services in Ontario and specifically recommended the removal of social barriers to AHR for LGBTQ people. Further, the Assisted Human Reproduction Act (AHRA) includes a non-discrimination clause barring discrimination based on sexual orientation or marital status. In this context, it is critical to determine to what extent AHR services are meeting the family creation needs of Canadian LGBTQ2S+ people. In the summer of 2010, we began recruiting LGBTQ2S+ people from all across Ontario in order to learn about their experiences with AHR services. Over 110 LGBTQ2S+ people responded to our call for participants. For a number of reasons, including the aim for our study to reflect the diversity of the LGBTQ2S+ population - in terms of sexual orientation, gender identity, geographical location, and race, to name a few of the many social determinants of health, as well as AHR service experience - we ended up doing a total of 40 interviews with 66 LGBTQ2S+ individuals (including couples, co-parents and donors) who had used AHR services since 2007, were in the process of using AHR services or who avoided using AHR services for a number of reasons (i.e., discriminatory AHR service providers, cost of AHR services, rural location, etc.). From the AHR service experiences that LGBTQ2S+ people shared with us, we aimed to: a) Describe the experiences of LGBTQ2S+ people with AHR services in Ontario; b) Identify perceived barriers and supports to AHR service access for LGBTQ2S+ people; c) Determine similarities and differences in the experiences of lesbian, gay, bisexual and trans people with AHR services; and 4) Use the knowledge gained to inform AHR service delivery in Ontario, and develop future Canada-wide research on this topic. Are AHR services meeting the family creation needs of LGBTQ people in Ontario? Sometimes. We found that the needs of some people are better met than others. In particular, trans people, individuals who wish to use surrogacy, and those wishing to use a known sperm donor seem to encounter the greatest barriers to accessing AHR services. We published a number of academic papers and other reports summarizing these findings and advocating for change (see Project Outcomes). Like all of our other studies, the Creating Our Families project was a community-based research project that included an advisory committee of relevant stakeholders, including LGBTQ2S+ parents, parenting experts and AHR service providers. Forum theatre workshops based on the data of the Creating Our Families study took place on May 27, 2012 (for community) and May 28, 2012 (CME-accredited for service providers). 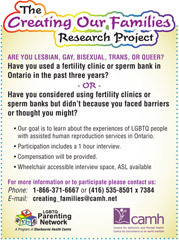 For more information, see Using Theatre to Disseminate LGBT Peoples’ Experiences with Assisted Human Reproduction Services; as well as the brochure Lesbian, gay, bisexual and trans people using assisted Human; the page In Honour of Pride Week - Assisted Reproductive Technologies (ARTs) and the LGBTQ community; and the page Scenes from a Clinic: Forum Theatre Helps Researchers Connect. Based on the Creating Our Families study, datejie green, Lesley Tarasoff, and Rachel Epstein created a Fact Sheet for AHR Service Providers and a Guidebook for LGBTQ Prospective Parents. In the winter 2012 edition of Infertility Awareness Association of Canada, Rachel Epstein wrote an article entitled “LGBTQ Communities: Times the are A-Changin’”. The results of the Creating Our Families study have been presented at a number of conferences and seminars, including at the 2012 Meeting of the North American Society for Psychosocial Obstetrics & Gynecology and the Canadian Institutes of Health Research-Institute of Gender and Health Conference. We published an academic paper on trans people's experiences with assisted reproduction services. We published an academic paper on sexual and gender minority peoples recommendations for assisted human reproduction services. 1. Assisted human reproduction (AHR) is also known as assisted reproductive technology (ART). AHR services or ARTs include intra-uterine insemination (IUI), in vitro fertilization (IVF), and surrogacy, to name a few. See a glossary of ART terminology. Ross, L.E., Steele, L.S., & Epstein, R. (2006a). Service use and gaps in services for lesbian and bisexual women during donor insemination, pregnancy, and the postpartum period. Journal of Obstetrics & Gynaecology Canada, 505-511. Ross, L.E., Steele, L.S., & Epstein, R. (2006b). Lesbian and bisexual women’s recommendations for improving the provision of assisted reproductive technology services. Fertility & Sterility, 86(3), 735-738. Epstein, R. (2008). The Assisted Human Reproduction Act and LGBTQ Communities: A paper submitted by the AHRA / LGBTQ Working Group. Toronto: Sherbourne Health Centre. Epstein, R. (2008). LGBTQ Communities and AHR Services: Beginning a conversation. Infertility Awareness Association of Canada.